Deep in the back corner of Devil’s Garden there is this amazing arch… unfortunately, it probably will not be around much longer. A few decades ago a huge portion of the arch fell off… if you google the web, there are actually people who were there to take pictures of it (think of the probability of that). They have since closed off the path that lead you directly under the arch. Even with its missing sections, Landscape Arch spans OVER 300 FEET! Thats about a football field length in the AIR. Crazy, right? With all the freezing and refreezing the rock within the arch gets weakened, and over the eons the arches can’t support themselves. Sigh. Sad to think that over time, all the arches we see today will fall to the same fate. I love how the arches I photographed lit up with this deep crimson red when the sun hits and the light bounces around and reflects this incredible color on their underbellies. This is another view of the famous Mesa Arch a few minutes after sunrise. To keep the detail in the shadows and highlights I shot this as a 5 frame HDR, blended them in Photomatix and then finished the image in photoshop with my favorite NIK filters (a little tonal contrast, and brilliance/warmth… I’ve noticed the HDR process leaves the rocks a bit duller than I remember). Amazing spot to see and witness. One photography note… I would HIGHLY recommend if you visit this location to shoot at sunrise. At sunset (when we visited), the main canyon is in shadow, and there is a ton of haze… so shooting the actual bend in the Colorado at sunset isn’t really inviting. Couldn’t seem to make anything work. 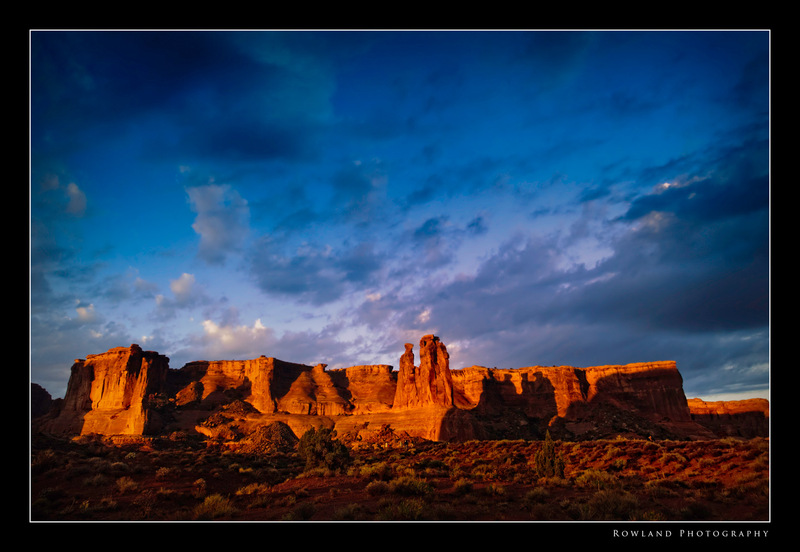 Luckily however, the red mesas that make up the area never disappoint when they catch the last of the suns rays. They light up red and tan and put on quite a display of earthy colors. Again, standing there seeing these mesas and their layers upon layers exposed by the mighty Colorado, you just can’t help trying to bend your mind around the epochs of geological time you are seeing. This is millions upon millions of years of nature at work… It almost hurts to think about, but when you are standing there for a fleeting moment you just feel very connected to the landscape around you. I’ve blogged and written about this before… there are truly moments when I just love being a photographer. When the light, the scene and everything around you comes into a “simple” focus. This is such a scene. It’s just the visual representation of the word “peace” in my mind. 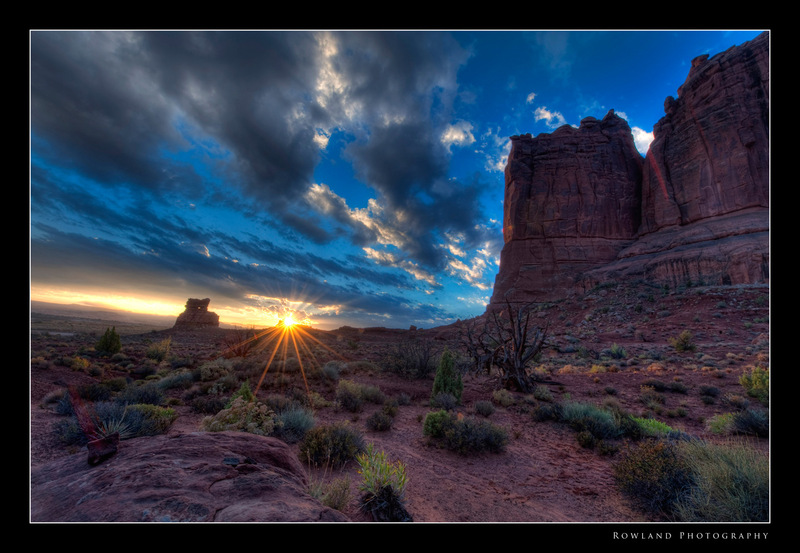 Simple sunrise… quiet space around you… crispness in the air… rocks that are millions of years old all around you. I’m privileged at these moments to have the equipment to distill this down to its basic nature. And that’s what it is… Nature, being Nature in all its tremendous glory. Those magic few moments when the warm first rays of sunlight strike the earth still give me chills. Amazing how that light can literally transform a scene. 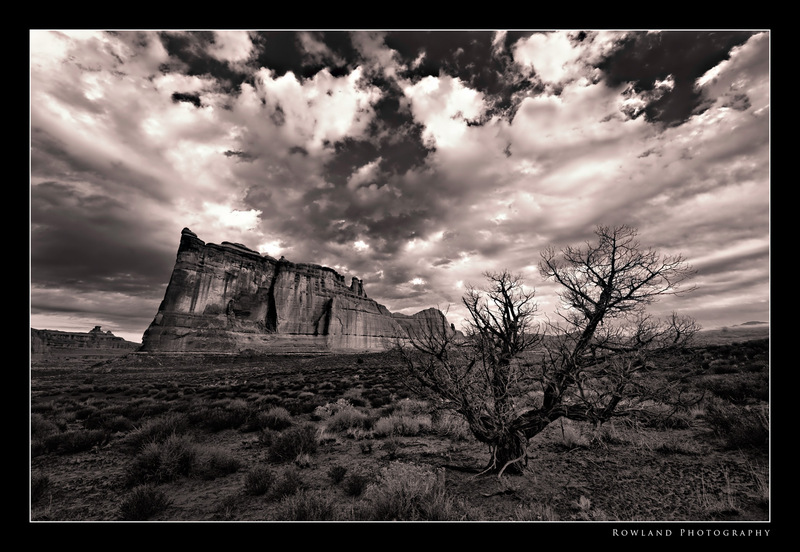 Thats the “three-sister” mesa in the foreground… love how they cast long shadows across the larger rock formation in the background. A quiet scene, worthy of capturing. This is a shot of the Courthouse Towers. Lots of desert scrub and gnarled pines, which I spent an awful amount of time trying to figure out how to include compositionally in a photo. Sorta succeeded, but could do better. This image just screamed black and white. From CS3, I launched NIK’s Silver Effects Pro, 2 clicks later… this is what I got. There is a lesson in this photo. Delicate Arch is roughly a 60 feet arch located at the top of a mesa in Utah. Takes about an hour to hike in, and the vertical part of the climb is pretty steep, not to mention a bit scary (especially for those that tend to get vertigo, like I do). The last 100 feet or so is a 3 foot ledge… no fence, with a drop a few hundred feet down. The reward was worth the scare though, that much I can promise you. When we arrived we had these great clouds overtop, great light all around and the promise of a “magical event.” As the sun dove to the horizon a cloud bank had appeared, and the magic light that we had waited over an hour for simply disappeared. Not that what was left was horrible, it wasn’t, but it wasn’t ‘magical’. Kept wishing for those clouds to part for the last few minutes and through them some warm, brilliant light rays would head our way… but on this endeavor, it wasn’t meant to be. 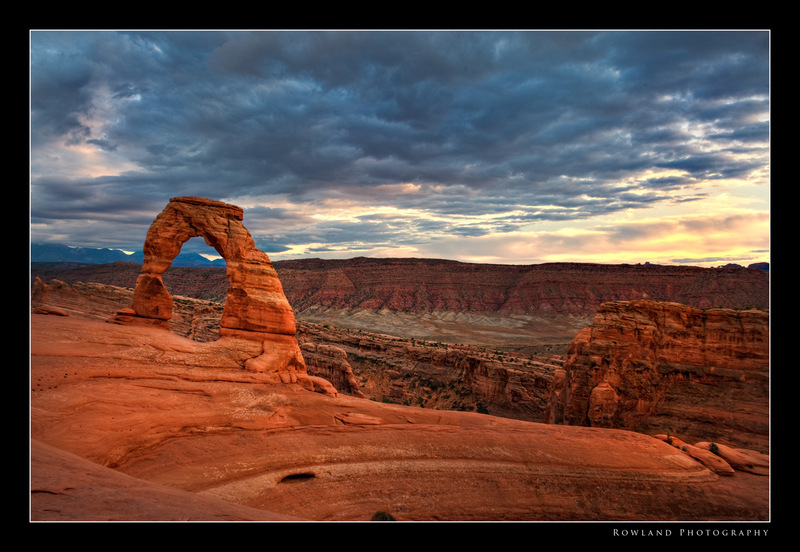 Word of advice, if you are shooting Delicate Arch, which you should if you are even close to the place, be there early. It was very crowded around the top, and tourists clamored to shoot themselves beneath the Arch itself. Me? I was too chicken-poop to even get over the ledge. Kept seeing myself tumbling down the mesa… not a pleasant sight to behold. Also… bring H20, I didn’t and by the time I got to the top (in about 40 minutes, I was trucking…) I was soaked through and through (remember, it’s about 40 lbs of stuff on my back plus the tripod, and you need a tripod up there when the light gets low). Moab, utah is the mountain-biking Mecca of the world. Riders from all over the place come to ride the world famous SlickRock trail. 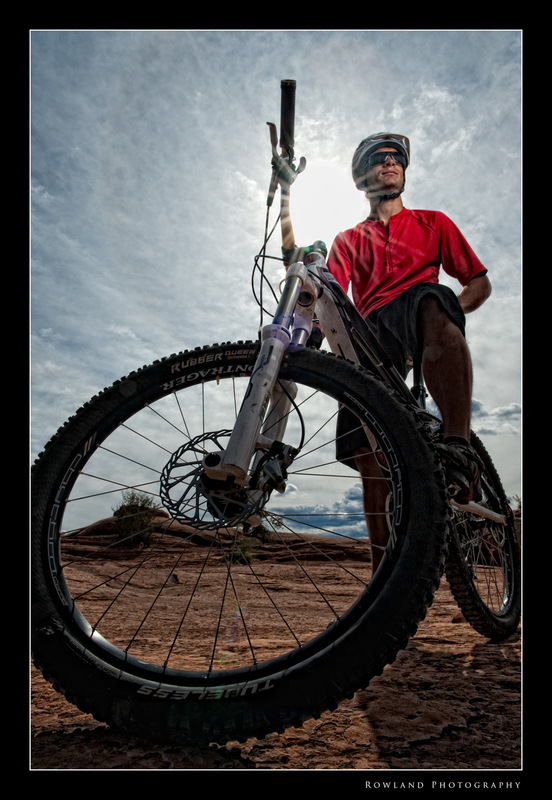 So it would have been a crime to shoot in Moab and NOT include something related to its rich mountain-biking heritage. Having once been a mountain biker myself (not a very good one, I might add, but I thoroughly enjoyed riding Mt. Snow and Killington in Vermont) I looked forward to working with Tyson, our MB model. He is orn and raised in the area and was obviously a talented rider. Scott Kelby arranged all of this and as soon as we hit the trail we had an off-camera flash with umbrella set up only inches away from Tyson’s face. Scott provided a PocketWizard for all of us shooters to use (“Hey! Can you please pass the PocketWizard down the line…)” and we snapped away with wild abandon. It was high noon as you can see from the shot- so flash was set to full power to try and provide enough light into the shadows on Tyson’s face. In post used a little tonal contrast (thank you NIK Color Effects Pro) to enhance the image and make Tyson pop a bit more. Backed off the filter on the sky to keep it more natural, and not to HDR-ish looking. Have to agree with his assessment. This is the world-famous Mesa Arch. 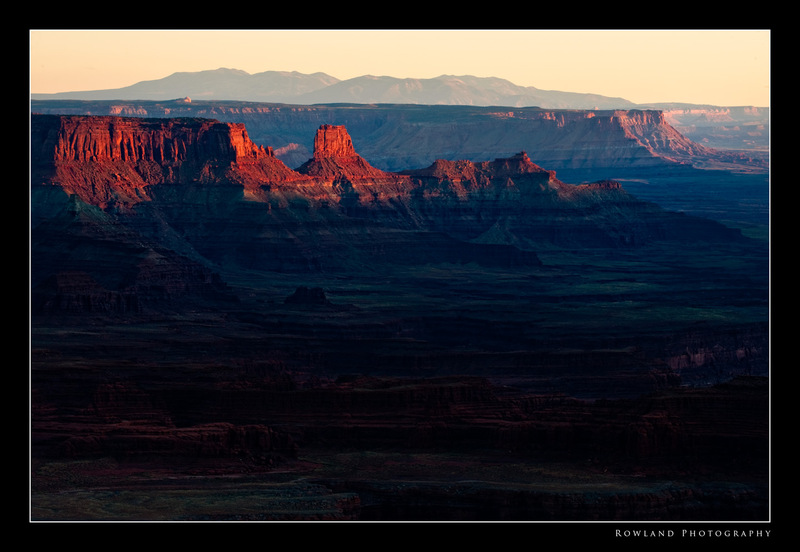 It overlooks a number of plateau’s spreading out across the various districts the Canyonlands are carved into (there are 4 to be exact). 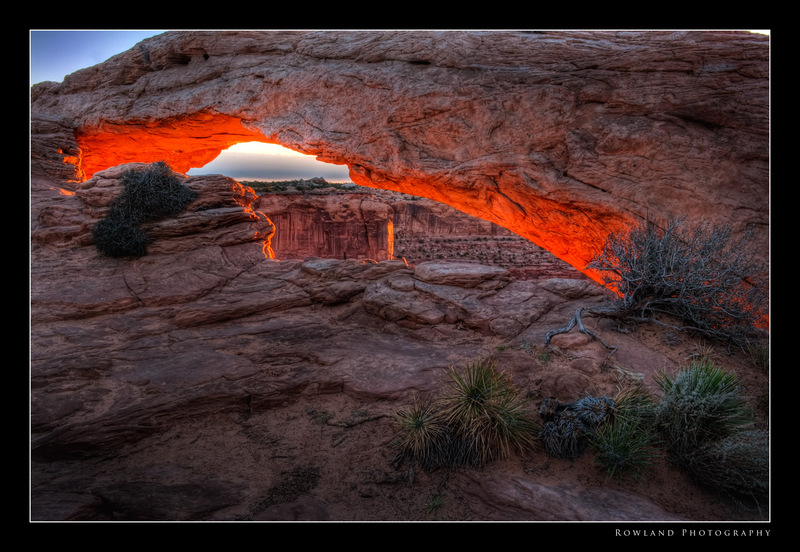 For early risers, on clear days the sun rises directly through the arch and illuminates the Arch’s underbelly with a brilliant and fiery red glow. I’ve seen other images, including Peter Lik’s photography and I always thought in the back of my mind that the red had been “bumped up” in Photoshop, or some other post-processing software. Having been there, I can honestly tell you, no post is required… it really IS that red and amazing. You gotta be up early, early in the morning to get there, and be prepared… LOTS of photographers show up to shoot this very seen. Turned into a bit of a stand-off for a little while as people would get pissy if you tried to slightly adjust your position and dare enter their frame. I actually found that about 3 minutes after sunrise you can move pretty freely around the area. 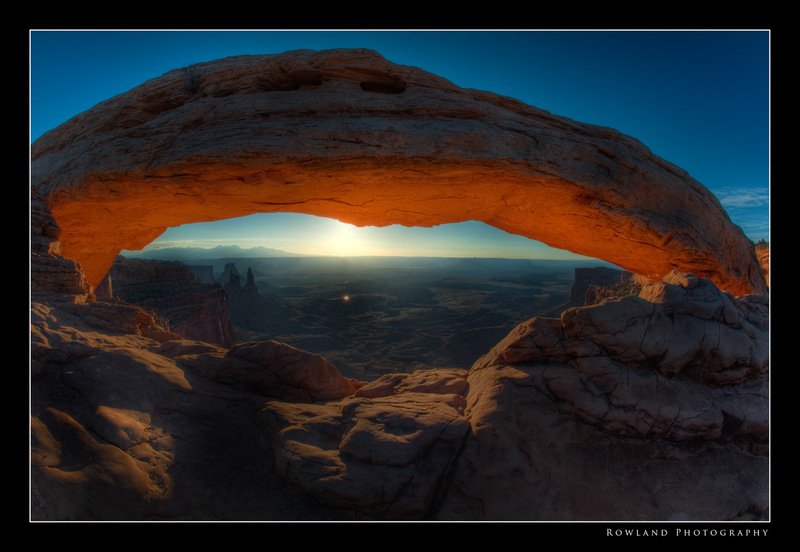 Shot this seen with a 16mm fisheye when the sun had already passed the arch opening. Funny thing, when I opened it in Lightroom I realized I got the sun’s reflection in the river below. Made for a nice little bonus to the shot. Moab Day III. headed into Arches National Park to shoot some of the amazing arches and rock formations sprinkled throughout this amazing place. Up at about 5:00am to be there and in position for that magic light the sun brings with it those first few moments it lifts over the horizon. My first location was Turret Arch. Got its name because, well it looks like a castle with a turret (duh! ), sitting in the middle of the desert. Tried to find an interesting foreground object to place before it… a weed, a bush, tree, etc. No luck. Struck out cold. I worked this subject hard as the first rays of the day began to break over the horizon, but to no avail. Was an extremely frustrating situation. (After post: deleted almost all of the Turret Arch images, they were so bad it was painful to go through Lightroom and look at ’em). 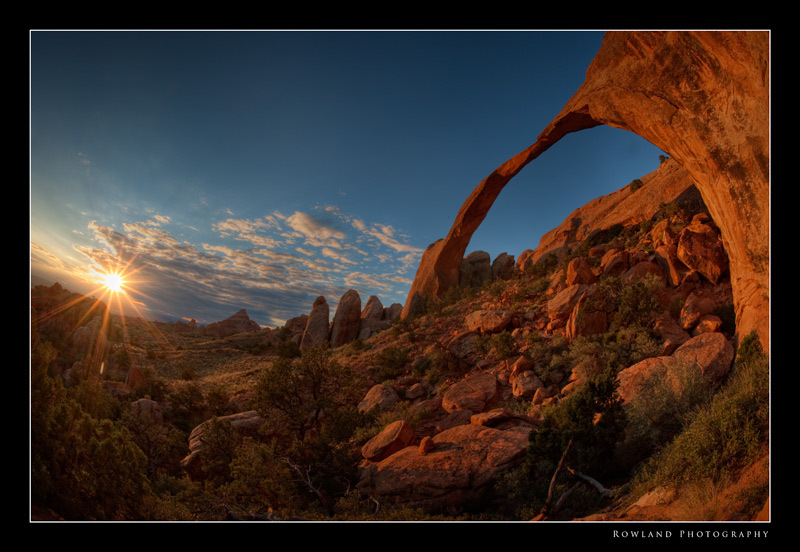 Stepped up to The North Window’s entrance, switched to the 16mm and composed the arch to fill the frame and also grab that magic starburst the sun creates at f/22. I love this shot. Dramatic, colorful and filled with texture. I just love the sun’s glow on the arches underbelly. It captures the sheer awesomeness of the location. What’s more amazing was my frustration level only moments ago about being in this incredible place and failing to capture the grandeur and majesty my eyes were soaking in. Moral of the story… think about the tools at your disposal when shooting. 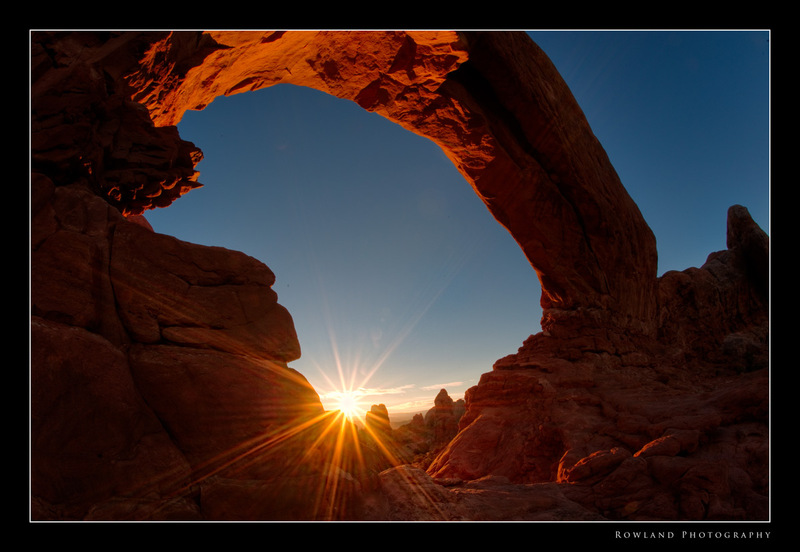 Sometimes its a lens switch, sometimes its about simply turning around (like I did at Turret Rock and saw the big arch of The North Window), and sometimes its sheer luck and timing (a terrific sunrise through the arch, no clouds to obscure its rise…).